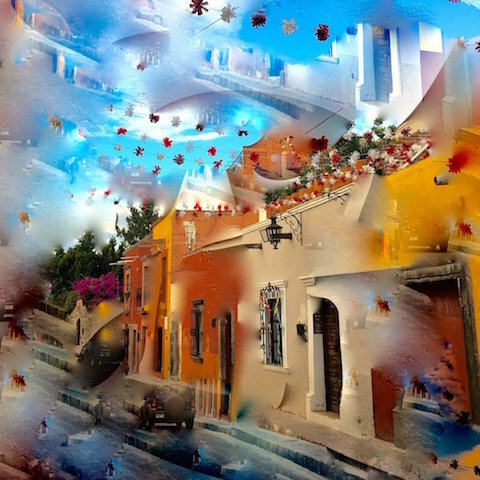 The first time, in 2003, that Parisian-born artist, Evelyne Pouget saw the indigenous dancers of San Miguel de Allende making their way up Canal to the Jardin, she was stunned. 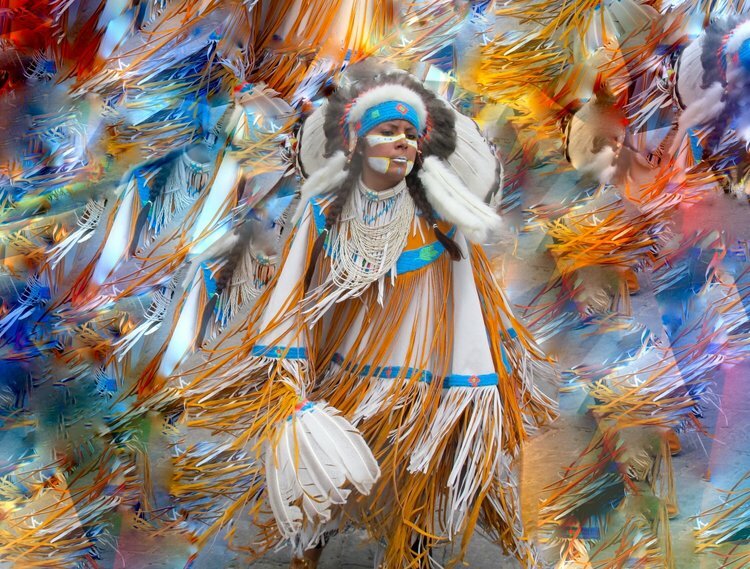 Never before had she seen anything like it, not in her home country of France, nor in the many countries she had lived or traveled to -- 500 people adorned with feathers, beads, body paint, animal skulls, and headdresses, all moving together, with great intention, to the beat of their tribal drums. Whatever power was calling the danzantes to leave their day jobs and take their ancient mysteries to the streets was also calling Evelyne -- and they became her muse. 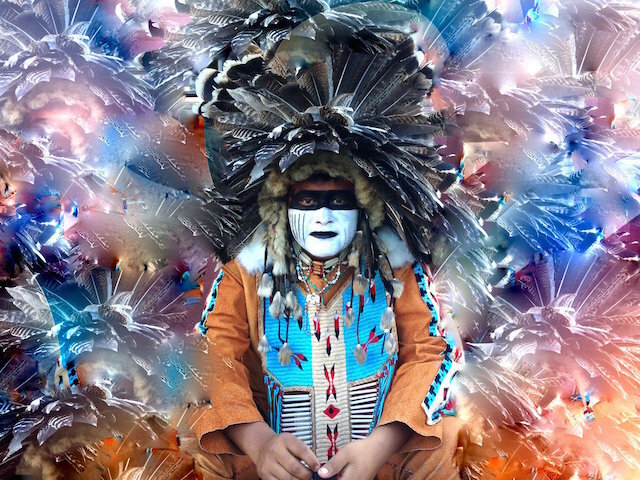 Although her clothes were different than theirs and the only face paint she wore was on her lips, her heart was beating to the same universal rhythm. And so she began photographing and painting them for the next 15 years, experimenting with many creative ways to amplify the beauty, power, and spirit of what they were expressing. Deeply committed to honoring the indigenous traditions she was learning about, Evelyne began meeting with local elders, wisdom keepers, and a Mayan Shaman. 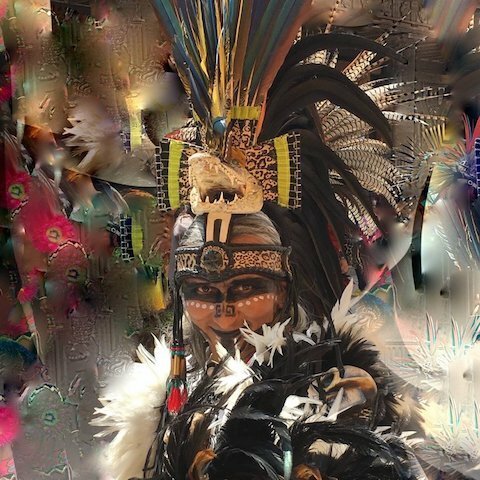 She searched the internet to further tune into what she intuitively knew existed at the heart of the Conchero's dancing -- a physical expression of a metaphysical reality deeply connected to Mother Earth and her own heartfelt commitment to live her life from a place of respect and gratitude. What she found both surprised and delighted her. 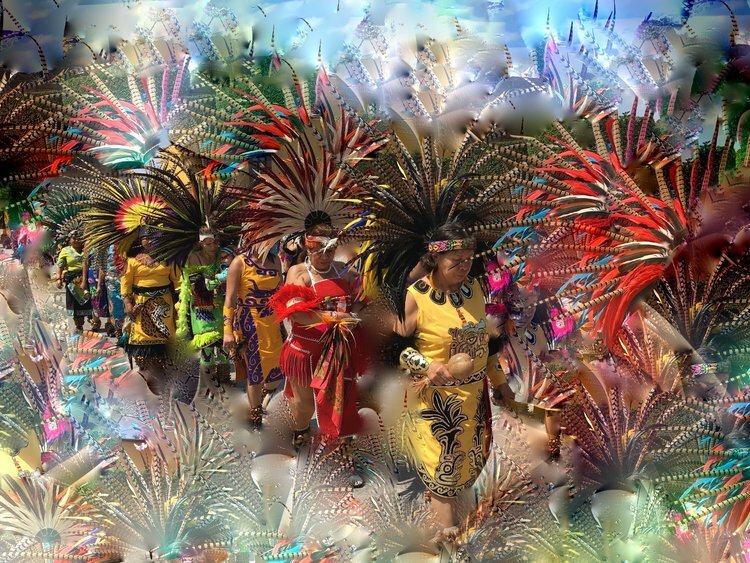 The dances she was witnessing on the streets of San Miguel emerged shortly after the Spanish conquest of the Aztec empire and were based on the old "mitote" dance -- one that was modified to include Catholic symbolism. 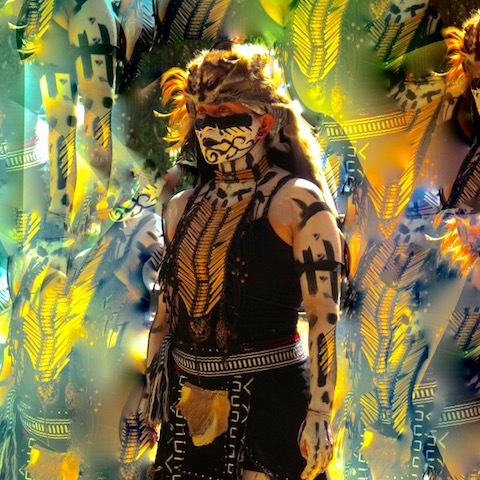 While the Spanish conquistadores tried to eliminate as much of indigenous culture as possible, they could not do so completely and much of it, to this day, remains embedded in the dance -- a dance that was created by indigenous tribes to re-enact the Spanish conquest of Mexico. 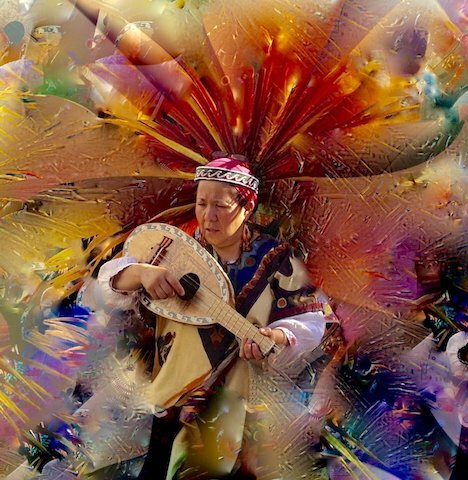 The more Evelyne experimented with her photography and her painting, the more she realized just how many of the danzantes were participating in the street dances for inspired personal and spiritual purposes. 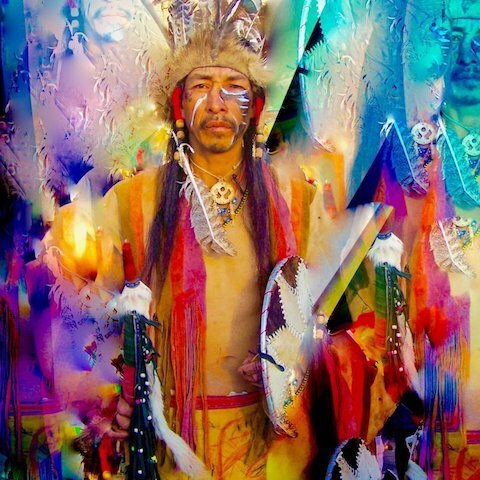 Indeed, many of the tribes, before they dance, gather together to pray, chant, ask their deities for permission to dance, and perform ritual cleansing. 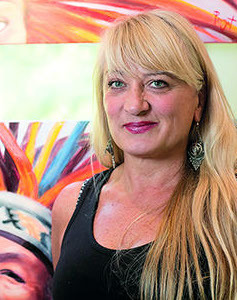 No matter how differently people interpret the origins, traditions, and intentions of the danzantes, there is one thing that cannot be denied: visual artists, like Evelyne Pouget, and thousands of other people from all walks of life continue to be inspired by the soulful expressions of San Miguel's deeply rooted indigenous traditions. 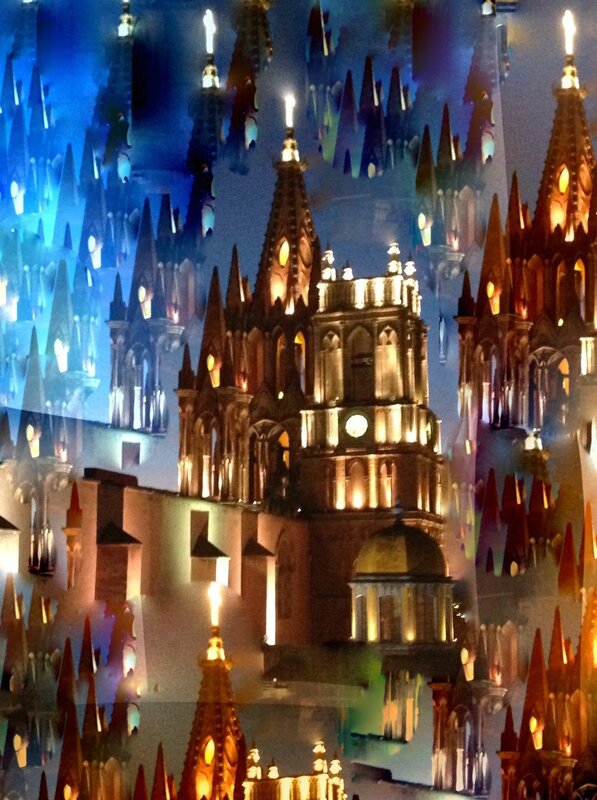 Evelyne Pouget's art, featuring the indigenous dancers and the architecture of San Miguel, will be featured in her March 30th Liquidation Studio Sale, 1:00 -- 5:00 pm, 61 Guadiana in Colonia Allende, between Cinco de Mayo and Las Flores All pieces will be discounted 40-70%. Some stories are told in words. 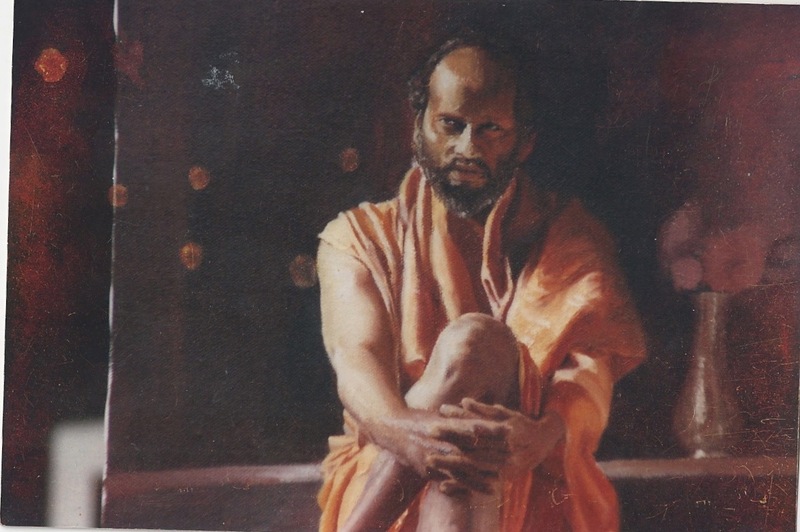 Others are told in pictures. 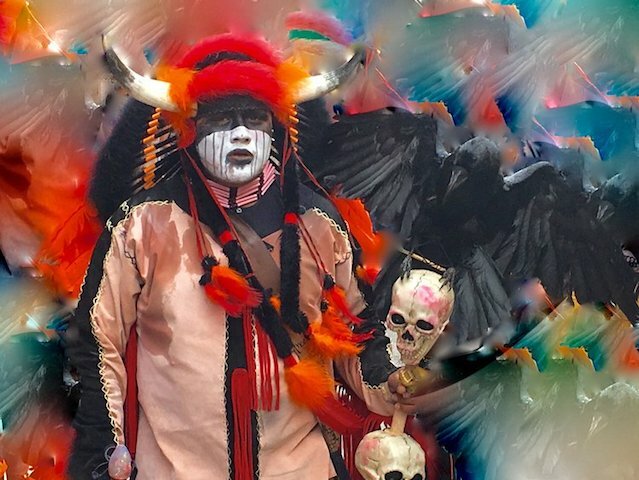 Click here for the extraordinary visual story of the sacred dancers of San Miguel de Allende, Mexico -- the work of peace artist, Evelyne Pouget. And click here for the Wikipedia back story.